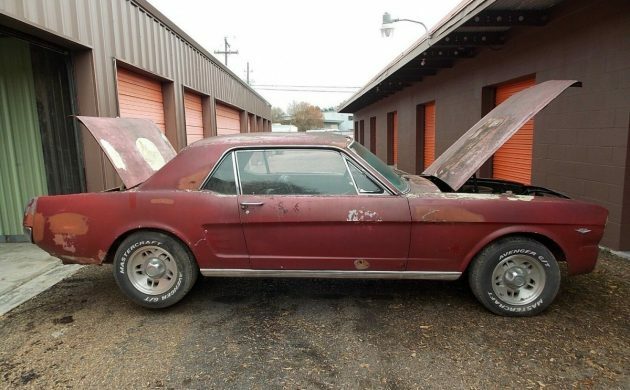 This 1966 Mustang is for sale by a private seller, but judging by the wording in the advertisement, it appears that he is open to an interest-free time payment plan, which might make the car that bit more attractive to some people. 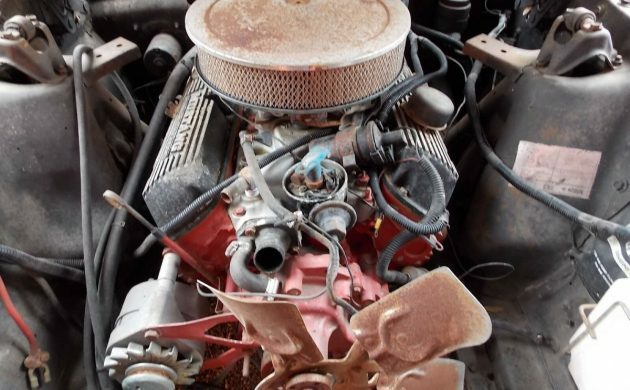 It doesn’t sport its original engine and transmission at present, but the correct transmission and associated hardware is included with the car, along with a reasonable stash of bits and pieces. 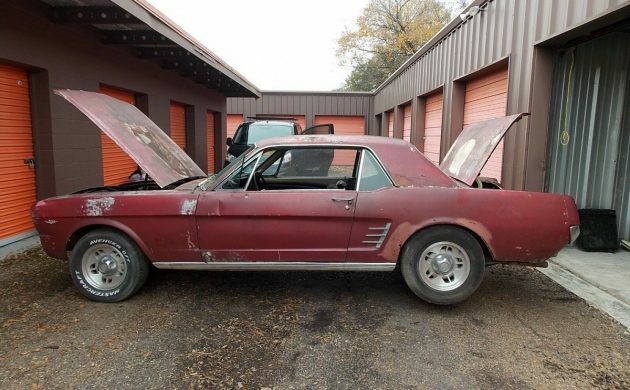 The Mustang is located in Houston, Texas, and is listed for sale here on eBay. The body of the Mustang doesn’t look too bad. There is some rust visible in the lower corners of the doors, and it also looks like there have been some repairs performed in the lower parts of both quarter panels and around the rear wheel arches. 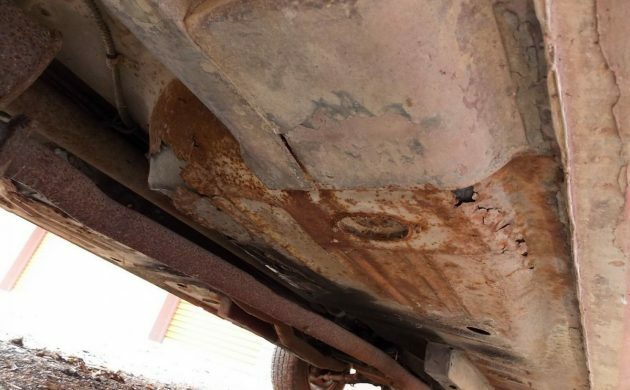 There is certainly rust in the floors, but the owner says that the torque boxes are solid, while the frame rails and shock towers also appear to be quite good. The interior looks like it is missing a few pieces, but what is there looks quite good. There is no driver’s door trim, and the card for the passenger door trim looks warped, but the upholstery itself, including the seats, look to be in good order. The dash pad does look a bit suspect on the front edge, and the car is fitted with an aftermarket radio/cassette player. Thankfully, it doesn’t appear that the dash has been cut to fit this. This Mustang was originally a 289ci C-Code car, with a 3-speed manual transmission. It is now fitted with a 302ci engine and an automatic transmission. 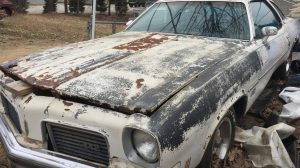 The owner believes that the engine may have had some work done to it, as it looks quite fresh, and has been fitted with headers and a high-rise intake. The engine doesn’t run, but it does turn freely. 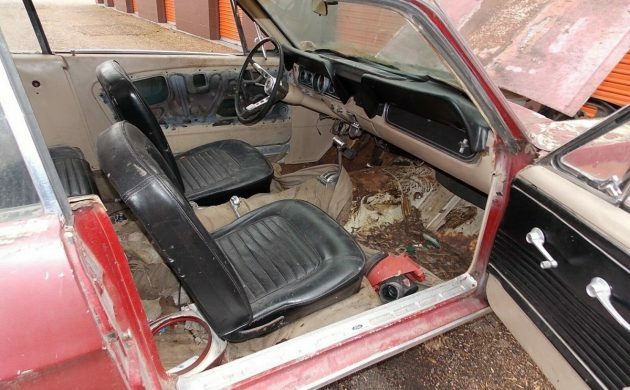 For those of you who might want to return the car to its original specifications, the owner is including a correct 3-speed manual transmission, complete with linkages, shifter, cross-member, clutch pivot arm, and an old clutch and pressure plate. There is also a stash of parts in the trunk, including the pullies and alternator for a serpentine belt set-up. This Mustang is not the best example that I’ve ever seen, but it is a long way from being the worst. The general lack of rust is quite encouraging, and it really doesn’t look like restoring it would be too difficult. It would probably be best suited to a person who just wants to build a nice Mustang to their own personal tastes, rather than for someone who is set on 100% originality. The owner appears to be quite flexible in his approach to selling the car. He has set a BIN price of $5,000, or the option is there to make an offer. 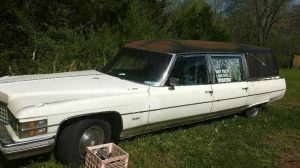 he also states that he would take a down payment of $2,000, with 3 monthly payments of $1,000 to sell it. The term “motivated seller” certainly has popped into my head. Definitely needs new floors, and most likely trunk. Wonder if they have the shock tower braces? They were probably removed during the engine swap to give them some wiggle room. Seems like a good DIY candidate. As Adam said,I’ve seen worse. Seems pretty solid but as always needs a good inspection. five large for one like this is a gift up here in the rust belt. The offer of financing is very generous, and I hope it works out for the buyer and seller. Could help someone get into a nice project. Good luck to all!! !